Biography & Genealogy: Julian Edward Wood, Class of 1866. New Market Cadet. Genealogy: Born- May 3, 1844 in Currituck Co., NC. Father- William E. Wood; Mother- Sophia M. Trotman. Pat. Grandfather- William E. Wood; Pat. Grandmother- Ann Grandbury. Mat. Grandfather- Ezekiel Trotman; Mat. Grandmother- Emily Dauge. Married- Mary J. Scott in 1874 Children- 1- Mae Wood Worth, who married A. H. Worth; 2- William E. Wood. VMI Record: Entered VMI- Jan. 16, 1862; Resigned Jan. 21, 1865 to enter the Confederate Army; Made Honorary Graduate of the Class of 1866 July 2, 1869. Also attended University of Va. 1867-68, where he was one of the founders of Pi Kappa Alpha Fraternity. 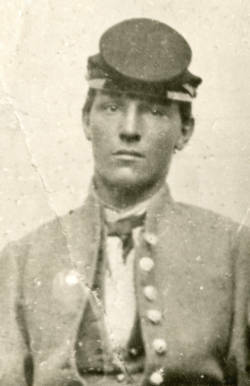 Civil War Record: Corporal for Co. C of the VMI Corps of Cadets (with color guard) during the Battle of New Market, May 15, 1864; Cadet Sergeant Co. A with the Corps of Cadets 1864-65 while cadets were stationed in the trenches in Richmond, Va. mid 1864-early 1865; enlisted in Confederate Army Jan. 1865, unofficial source says he served as 1st Lieut. and Drill Master for NC troops, but no official service records are found. Careers: Physician; Col. in NC National Guard. Died- June 2, 1911.